I have a Café Sabarsky gift card that expires soon so I figured I could use it last week when my friend came to visit. 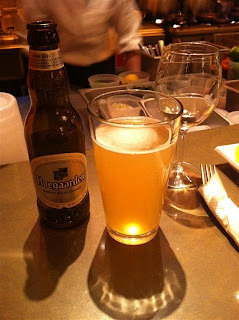 She got into NYC around 3:00 and we immediately headed uptown to Sabarsky. I was expecting a line but not one as long as we encountered. It was almost out the museum door! She didn’t feel like waiting so we trudged back out into the wet, puddle filled streets and ended up down at the Plaza inside Todd English’s new food court. Things started off a little rocky. The manager told us it would be a 5 minute wait but then we stood for almost 20 minutes. Then they seated us in the very last section where the door kept opening and closing. I seriously contemplated just leaving but we were really hungry at this point and decided to stick it out. I wasn’t feeling any of their wine selection so I started off with a safe but boring Hoegarden. The only reason I mention this at all was because of the price. My Hoegarden was a reasonable $7.00. This was a nice surprise since the Oak Bar upstairs I remember paying upwards of $10.00 for a beer. So the service stinks but at least the prices are slightly lower. 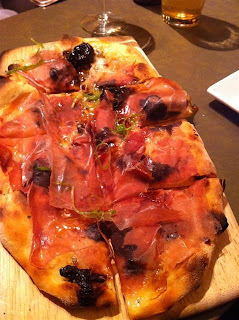 This is the Fig and Prosciutto Flatbread. Thank Goodness we decided to split our order! This thing was enormous! The flatbread had big airy pockets on the end and a wonderful thin crunchy char in the middle with a dusting of rosemary. Unfortunately some of the components needed work. The cheese on the flatbread was gorgonzola and it wasn’t distributed very evenly. Some times I would be overpowered by the cheese and sometimes I wouldn’t get any at all. A well spread out goat cheese would have been better. The fig jam was also a little strange as it wasn’t a jam at all. Whole figs were strewn about and again it made it difficult to have one uniform bite of all of the components. That aside this was a tasty flatbread. If they smooth the toppings out this would be a nice option for two to share. I love the vibe and energy in the Plaza but they really need to work out the kinks still. We had four different waiters over the course of our meal but no real service. At the end I had to flag someone down for our check and I still don’t think it was any one of the four we had. I’ll give it another try outside the holiday season and see if that makes a difference.